If you find yourself asking that as you learn more about cigars, welcome to the club. 1 What Is A Hygrometer? 2 Why Is A Hygrometer Important? 5 What Is The Best Humidity and Temperature for Cigars? A hygrometer is a device that measures moisture in the air, also known as humidity. 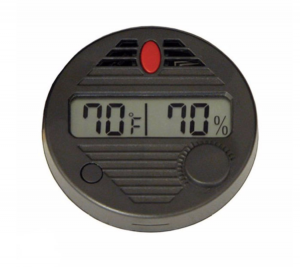 This little device is your insurance that your cigars are aging nicely in your cigar humidor by monitoring the temperature and humidity inside. To be clear, it serves purely as a monitor, it does not actually regulate temperature or humidity. A hygrometer is one of two essential pieces for your cigar collection. The other essential piece being a humidification device that actually keeps the moisture in check. We recently just completed a great on all of the different cigar humidification methods out there if you’d like to find out more. Why Is A Hygrometer Important? A hygrometer is important because it gives you a read on what conditions are like inside of your humidor. Unfortunately you can’t just throw your cigars in an old cigar box, there has be to some moisture so they can retain that delicious flavor. A hygrometer is your best defense against beetles, mold, or your cigars drying out. You would be surprised how much your temperature and humidity can differ from the exterior, especially if your humidor is in sunlight, on top of a computer, or in a basement. All of these locations can have an impact on the temperature and humidity so be careful! Many times a humidor will have an analog hygrometer included. By analog, I mean there are actual little arrows that designate the metrics. It’s tempting to trust these because they are normally included with a humidor and make it easy but they are often wildly inaccurate. Unfortunately manufacturers don’t do much testing on these devices and they are often cheaply made. We strongly recommend upgrading to a digital hygrometer for more accurate readouts and reliability. After all, you are likely going to be putting a pretty penny into your cigar collection, you need to make sure you can keep a close eye on them. Even if you have a digital hygrometer, they can be a bit inaccurate out of the box. Therefore you need to calibrate them – which means that you need to make sure the humidity and temperature readings are accurate. 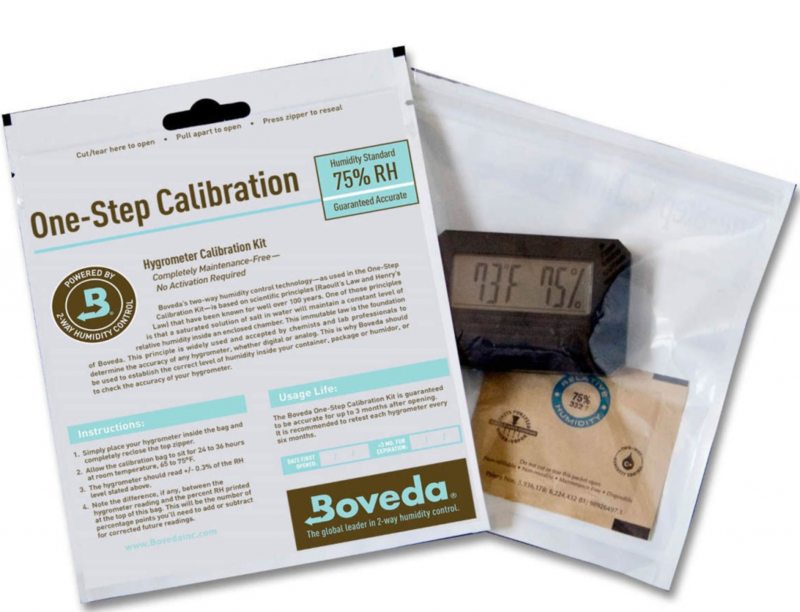 Step 1: Purchase a Boveda calibration kit or simply use a Boveda pack and a Ziploc bag. Step 2: Turn on your hygrometer and place it in a Ziploc bag. Step 3: Now seal the bag and place it inside a drawer for 24 hours to limit external impacts like light, heat, etc. 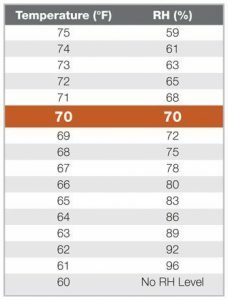 Your hygrometer humidity reading may be a couple points off from what the Boveda pack says on the package. If this is the case, simply adjust the reading on your hygrometer. Depending on the make and model, this is a little different for each but should be pretty simply described in the instruction manual. Now you are calibrated and ready to rock! If you are in the market for a hygrometer for your cigar collection, check out our rankings below as we pick the best hygrometers available right now for your cigar humidor. What Is The Best Humidity and Temperature for Cigars? Ah, the age old question… quick answer: it depends and it’s a matter of personal preference. I’ve spent many hours scouring forums and you’ll always find an expert somewhere claiming that a certain temperature and humidity is the end all, be all rule. However, you’ll find varying opinions everywhere. My personal rule, and the most common, is to get as close to 70 for each measure. Many cuban cigar smokers prefer to be closer to 65% humidity and aim to keep their cigars under 70 degrees (F). One personal tip I’ve found is that if you do keep your humidor at 70 degrees (F) and 70% humidity, you may want to “dry box” the cigars before smoking. Dry boxing really means just putting the cigar in a box temporarily (12 – 24 hours) before smoking it. This really helps eliminate the small chance that your cigar will be plugged and can help prevent burn issues if you do keep cigars at 70/70. Bottom line, all cigars are different – some may smoke better at a certain temperature vs. others. Pick a value that you are comfortable with and go with it! Reputation for being very accurate when it comes to measuring humidity inside of your cigar humidor – much more accurate than analog or cheaper models. Comes out of the box calibrated – but also re-calibratable. We highly recommend re-calibrating to test just to be safe – preferably with a Bovada calibration kit. Magnetic adhesive strip and battery included. This isn’t a huge perk but definitely makes it convenient to be able to pop it out of the box and use immediately. Although it may be a bit a bigger in size (4 inches long), the extra space it takes up in your humidor is well worth it. The unit itself is about 4 inches long. Some owners have complained that their units are hit or miss upon arrival but I can tell you first hand that has not been a problem for me personally. I can tell you first hand, having a hygrometer that just works and doesn’t require you to keep checking it out of paranoia is a beautiful thing. 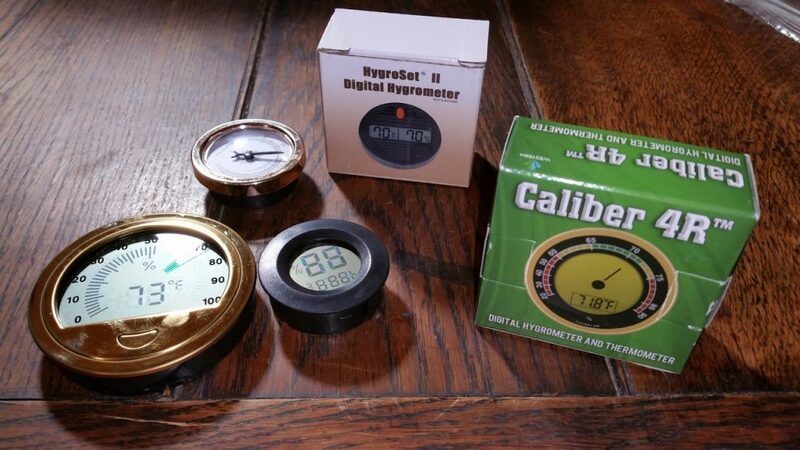 The Caliber IV is no different – this company has been making hygrometers for a long time and they have lots of happy customers. Sacrificing room for one less cigar to protect the rest just plain makes sense. The beginner friendly price point and small size help this hygrometer make our list of best hygrometers for cigars. This is the first hygrometer that I’ve purchased and I have been personally been using it for a tupperdor for about two years. The only downsides are that this unit needs recalibration annually and before actually using and the controls are not super user friendly. If you have a wineador or larger humidor, this hygrometer makes a ton of sense. 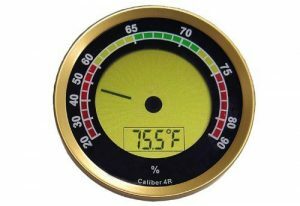 The gold trim and unique temperature and humidity read out on the Caliber 4R make this one of our picks for best hygrometers.